March 2019 – Samantha Boulanger and Elaine Turnbull. Samantha is a self-taught seamstress. Also known as ‘The Accidental Upcyclist’. A forager and rescuer of all things fabric, trying to save unwanted clothing and textiles from ending up in landfill. Creatively revamping and recreating them into unique, funky upcycled eco finery, giving them a new lease of life. In 2009, Samantha created the upcycled clothing labels ‘Kaotic Kittus’ and ‘Guto the Whippet’. Pickled Tinc is a collection of Jewellery made from reclaimed and upcycled materials. Off cuts of electrical wire, removed copper water pipes and other found bits and pieces. Some beads from charity shop finds and bits of a fly tipped caravan. Elaine has always been drawn to making pretty things out of other peoples rejects and off cuts spending years making expensive looking items for the stage on very tight budgets and delighting in finding the beauty in discarded metal. All items are hand made using hand tools in a solar powered workshop in Mid Wales. Don’t waste it, wear it! February 2019 – Claire Fowler who trades under the name of Jones and Ginger. Jones and Ginger was born out a change in direction summer 2018. I have sewn for decades but now have more time to play in the sewing room and be creative. I am drawn to designing and creating individual items from wonderful fabrics that are being re-imagined, re-purposed, recycled and re-loved. I enjoy taking time for the details…. the reclaimed pockets, the lining fabrics, the two sided straps and the smaller idiosyncratic elements that make up my bags. I am now a regular at charity shops where I source most of my fabrics ably helped by my Mum who has taken up the challenge of rummaging for fabulous fabric finds. Equally I love the Welsh fabrics, be they the new patterns from Welsh Woollen Mills such as Melin Tregwynt in Pembrokeshire or Trefriw Mill in the Conwy Valley or the more traditional Welsh tapestry and blanket designs. When the two elements come together and I up-cycle a Welsh blanket then that seems perfect. I have lived in Talybont for the past thirty years and when the weather is fine you will find me pottering in the garden or walking the hills, but luckily the Welsh weather allows plenty of time in the sewing room. I live in the beautiful Pennant valley and much of my inspiration comes from my immediate surroundings. I am also close to the moorland around Glaslyn and Bugeilyn and spend a lot of time walking my dogs there. I am largely self taught although I have attended some Lifelong Learning courses run by Aberystwyth University. Seascapes are another subject I enjoy and three years ago I travelled to Holland to paint with Roos Schuring a seascape artist I greatly admire. Other artists whose work I enjoy include Joan Eardley and Kyffin Williams. My paintings are a mix of plein air and studio. I particularly enjoy the challenge of painting in front of the subject in oils. I am a founder member of Arwystli Artists, a small group of like-minded artists living and working in Mid Wales. Arwystli Artists can be found on facebook. November 2018 – Jillian Hickson, Fine Artist. In my practice I enjoy painting Still Life, there is something fundamentally fascinating to me about painting a pear or a bowl or a bunch of grapes, it’s a beautiful thing to recreate these things in paint. I mainly work in oils, but also in acrylics depending on whether I want the painting to be more loose and abstract or realist. In addition to painting, I also enjoy printmaking, working in mixed media/collage. During the last two years of my degree course at the School of Art in Aberystwyth, I have also studied and practised printmaking, life drawing and illustration alongside my painting, these disciplines have a place in my practice, but my heart is where my paint and brushes are. I just love the fear of being confronted with a blank canvas, It’s exciting anticipating what might happen although I have an idea in my head or in my sketchbook, it is seldom what happens and the finished painting is always a surprise! I live on the Border between England and Wales and find inspiration in the animals and myths of both countries as well as those of Scotland where I have family links and frequently visit. At the moment most of my work is based on animals and birds. I am a printmaker who also works in mixed media and collage. The three are linked in that the same techniques are used – mainly involving sticking materials such as paper and thread onto a base which is then either used as a print plate or painted to produce a finished picture. For the past 26 years I have lived in Oswestry and regularly exhibit in the Willow Gallery. I am also a member of the local Borderland Visual Arts network and take part in their Open Studios event held in the middle two weekends of June each year. Initially training as a fine artist, Nick went on to gain a first class honours degree in 3D Design, then a Masters Degree in Industrial Design. Following a successful career as a designer in London, in 2007 he opted out of the London rat-race and moved with his wife and daughter back to North Wales for an altogether better quality of life. Living in the hills of Snowdonia in an old farm house, he is now able to fully focus on painting and drawing. Nick works mostly in watercolours and pastels, but his background in commercial and architectural design has lent itself very well to the detailed pen and ink style that can be seen in much of his work, in particular his book illustrations. His landscapes are notable for their dramatic skies, and with a few strokes of a brush or a pen he is able to capture the character of old buildings, the delicacy of a tree, the flight of a bird, or the cragginess of a rock face. Initially displaying his work at local Art Society exhibitions such as the Aberdyfi Art Society, CRYD and the Meirionnydd Artists Society, in 2009 Nick helped create the Dyfi Arts Guild based at Y Plas, Machynlleth. In the summer of 2012 an opportunity arose to rent a vacant shop in Aberdyfi. Nick and several other professional artists held a ‘pop-up’ exhibition under the name ‘ArtWorks’. Its popularity and success inspired Nick and his wife Kate to turn this into a permanent venture and ArtWorks Aberdyfi was born, a brand new gallery was built in Aberdyfi, which opened in April 2014. Nick has a permanent exhibition in Artworks and is exhibiting with us in Oriel Seren as a Guest Artist until 30th June. Ann Owen has lived and worked in the Dyfi Valley for over 25 years. The beautiful natural landscapes and especially the local beaches provide the inspiration for her work. Combining art glass, recycled bottles and beach-combing treasures, her work is unusual and innovative. The play of light through coloured glass brings the pieces to life, giving each one a unique spirit. As a self-taught artist I use the natural environment to inspire my artwork, particularly the coastline. I have always loved the sea and the coast and its ever changing environment and so my work often reflects the sea, exploring the colours and atmosphere of coastal environments. I use a variety of media, mainly acrylic. Living in mid Wales there are many small coastal towns and villages which provide never ending inspiration. Animals and plants also feature in my art. From an early age I have lived in the country, and enjoy drawing and painting the plants and animals found in rural landscapes and gardens. When not painting I enjoy photography, walking and cycling in the Welsh hills. May 2018 – Annabel Cooper – Reduction Linocuts. Lost at Sea and Other Cats. Annabel Cooper is a printmaker (at last). I studied Fine Art Sculpture at Brighton University many years ago. I chose sculpture because I only seemed to be offered sculpture or painting as art options and I really can’t paint! Despite choosing sculpture my work tended to be paper-based, embossing, photography and text art. I worked for a few years making the mock-ups and models for a book design company which was a wonderful job, but didn’t offer enough money to survive. So I decided to retrain as a plumber; that would allow me to afford to find time for art, right? No, life got in the way and I forgot for a good while that I am an artist who happens to be good at plumbing. A few years ago life got difficult and I remembered. With help and encouragement from a successful printmaking friend of mine I took up reduction linocuts. A reduction linocut destroys the printing plate as it is produced, so the edition of prints is limited to the initial amount. Each different colour layer is printed on top of the last by removing parts of the lino as you print each layer. It’s a laborious process which I love. I have always produced art that deals with identity, and the lost at sea series carries on that theme. The characters offer some information as to their identity, inviting the observer to wonder at their story and how they may have gotten lost. Jean specialises in creative landscape photography and the magnificent scenery of the Snowdonia National Park where she lives is the main inspiration for her work. Man’s influences on the landscape are a recurring theme in her exhibitions, images and books. She enjoys exploring the Welsh landscape and the camera helps her to select elements that embody the experience of being ‘in the ‘place’. Her primary motivation as a photographer is to promote appreciation of the versatility and creativity of photography as an art form – photography can be more than just a method of ‘recording’ moments. She also believes passionately in ‘art-for-all’, giving everyone who wishes to, the opportunity of seeing their work displayed in a public space and she runs art projects and workshops with people of all ages and abilities throughout the UK. Jean is an Associate of the Royal Photographic Society and holds an MA Distinction in Photographic Studies. Jean is best known for her photographic three books on the rivers of Wales: “A Tale of Two Rivers – Mawddach & Dyfi”; “Snowdonia River Tales – Glaslyn & Dwyryd” and “The River Conwy – Source to Sea” and her many exhibitions; her latest book is “Rhinogydd-Ancient Routes and Old Roads” which documents this magnificent mountainous area of North Wales looking at the relics left by man through the ages. Please visit her website for a selection of her images. MachCraft meet at the Bowling Club in Machynlleth. These Artists and Craftmakers put together a wonderful variety of work – Ceramics (Decorative and Functional), Crocheted Hats, Embroidered Bags and Tea-towels, Felt Birds, Knitted Mittens, Socks & Shawls, Painting & Peg-loom weaving. Sue Field is an acrylic painter who loves colour and detail. Contact via Oriel Seren. MachCraft is a small group who meet on a Monday morning in the Bowling Club from 10.30am to 1.00pm and are happy to welcome new members. February 2018 – Ivor Arbuckle‘s original Papercuts based on Myths, Legends and Scary (Hairy) Tales. I was born in Derry in Northern Ireland and moved to Birmingham to study Graphic Design and Illustration, receiving a B.A.(Hons.) Degree in 1987. After graduating, I taught at H.N.D/H.N.C. Level at Stafford College, at degree and Foundation level with a 0.5 post at the University of Coventry and on Art Foundation at U.W.E. In Bristol. During this time I was co-director and art worker with Splinter Community Arts Ltd. A not-for-profit co-op based in the West Midlands but working all over the U.K. We worked with all levels of (dis)ability, ages and ethnicities. Much of our work was either textile based (large scale collaborative banners with Linda Merriman, my partner and the other Director of ‘Splinter’) or spray-can murals on canal sides and other public sites. I also worked with groups on graphics, posters, leaflets, graphic novel projects and long term residencies. My freelance work has included tee-shirts, corporate identities, leaflets, posters, web graphics, designing and producing magazines, illustrations for books, talking books, C.D. covers and inserts and commissions. We moved to Llanfachreth in 2004 where we live the ‘good life’ halfway up a mountain, producing a lot of our own food on a Permaculture holding. Since moving here I have taught courses for Lifelong Learning at Aberystwyth University, given guitar and mandolin lessons and sold our produce and artwork on Dolgellau Farmers’ Market. I gained my 2nd Dan Black Belt in Wado Ryu Karate and run my own club in Llanelltyd teaching Karate and self defence. I continue to teach drawing skills to local art groups. I have a lifelong interest in Horror stories, myths, legends and folk tales that began with Norse mythology and Marvel comics, moving on into Graphic Novels. Visual influences include Jack Kirby, Hokusai and Alphonse Mucha, amongst others. My current work explores storytelling, with the development of my cut-paper techniques and new ways (for me) of printmaking. I have tried to mix well known stories (such as the red Welsh dragon fighting the white dragon) with more local stories from where I live in Llanfachreth. or telephone at 01341 422177. January 2018 – We were delighted to be able to showcase work created by students at Ysgol Bro Hyddgen, with assistance from their Textile teachers and inspiration from visiting artists. Opposite Oriel Seren, in Heol Maengwyn, is the building in which Laura Ashley worked at one time. The production of Textiles has been a fundamental part of life in the British Isles for centuries and created wealth and employment for many, many people. Arts and Crafts, whether by individuals or larger businesses, are responsible for a substantial proportion of the Gross National Income in the UK so we believe it is extremely important for us to encourage and display work by younger and / or emerging artists. December 2017 – Tony Vine, who trades as Stone Tones, is a permanent Showcase Artist at Oriel Seren selling his Steampunk and Mineral Jewellery. As our Guest Artist Tony showed another side of his work – beautiful Minerals and Fossils which he has cut and framed. During a cupboard clear-out in 1997, I unearthed a long-forgotten gift of a simple tumble stone polisher and, alongside it, a sand-castle bucket of stones collected from Llandudno beach by my children, many years earlier. Eight weeks later, the first batch of stones gleamed brightly on a tea-towel and I was hooked – what had begun as a mild curiosity developed into an absolute passion for the stunning beauty concealed within so many seemingly drab stones. Over the next couple of years my hobby moved from a corner of the kitchen cabinet to a workshop in the cellars of my home and a rapidly expanding array of diamond saws, grinding wheels and polishing machinery, plus rock from every corner of the globe. Almost entirely self-taught from books and magazines published in the 50s and 60s, more was learned from failures than successes, but gradually skills developed. Initially, I concentrated on cabochon gemstones in jewellery settings. Then, searching for a way to display a larger area of the intricate pattern and colour of the material than that afforded by conventional jewellery, I developed a technique for displaying slices of polished semi-precious stone in three-dimensional frames, as wall art. From simple tumble stones to cabochon jewellery, and then on to decorative wall art, my love affair with the endless variety of natural beauty from within the Earth prompted me to quit corporate business in 2005, and commit fully to the wonderful art of lapidary. My latest project has been into the world of “Steampunk” jewellery, a rapidly growing area of fashion that utilizes designs that incorporate an essence of the Victorian/Edwardian Industrial Age – think H G Wells’ Time Machine, lots of brass, copper, cogs and pistons, and you will get the idea. I am Secretary for the Gwynedd and Clwyd Association of Craftworkers, and also organize Craft Events on their behalf. November 2017 – Rosie White is a self-taught jeweller, botanist and artist living just outside Dolgellau, in the Snowdonia National Park. Her work is inspired by a love of plants and a desire to make visible the tiny details, shapes and forms unique to each one. The photographs of Karl Blossfeldt are particularly close to her heart. She is largely self-taught and has, over the years, gained skills in a number of creative disciplines including botanical illustration, painting, sculpture, decorative paintwork and jewellery-making. Her current jewellery collection is created from casts taken from individually-made moulded impressions of natural materials; leaves, seeds and buds in particular. Some of these pieces are made from recycled fine silver (99.9% pure silver – a higher content than sterling silver) and others from hand-painted and decorated polymer clay. Many of these pieces incorporate her own handmade, recycled, twisted silk cords. The range includes pendants, earrings and yoga bracelets. As a compulsive collector of a huge array of natural wonders found on her travels (such as beach and river stones, shells and driftwood) Rosie incorporates some of these into an unusual range of wire-wrapped jewellery. She utilises fine and sterling silver wire, copper and brass and a whole range of semi-precious gemstones, including labradorite, garnet, turquoise, aquamarine, freshwater pearls, rainbow moonstone, amethysts and opals. Decorative designs with hand-gathered pressed flowers and leaves have resulted in a range of printed cards and gift tags, to compliment her jewellery collections. Rosie’s work can be found on her etsy shop – Pulakesh Designs – and she is in the process of creating a facebook page of the same name, in honour of her adored furry companion – a big grey standard poodle, whose Hindi name means ‘joyful spirit’. Nuala has worked in Outdoor Education for the past 25 years, giving people opportunities to experience adventures – in the mountains, on rivers, and on the sea. This immersion in the landscape teemed with extensive journeying and travel has deepened her interest both in the environment and landscape painting. She likes to work outside and tries to capture a feeling of being in the landscape or taking the viewer on a journey through it. She has been greatly influenced by the vibrancy of colour on her travels in India and likes to take a bold imaginative approach to her work. Nuala especially enjoys commissions of favourite mountains and landscapes, and is available to lead guided walks in the hills or journeys by canoe . Based in Swyddffynnon, Ceredigion. Samantha is currently studying Fine Art at Aberystwyth University with a keen interest in Printmaking and Photography. Her influences are often animals, especially her whippet Guto. Also, the shapes, silhouettes and patterns within nature. 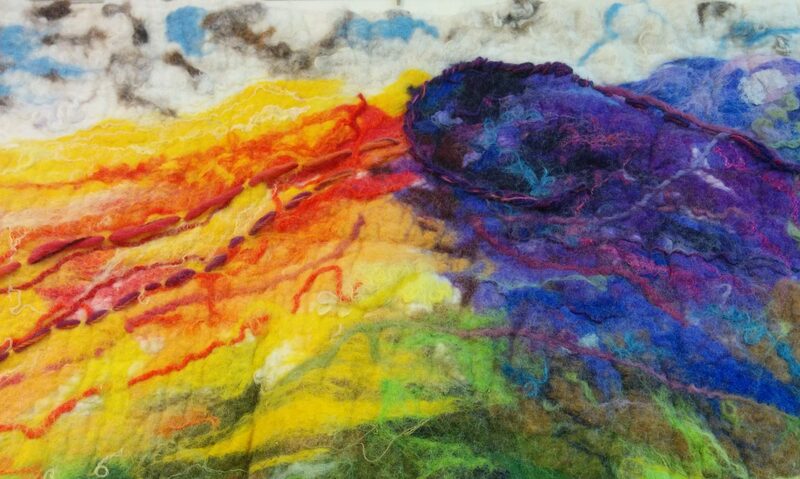 Sue Clow is a textile artist and small holder living in Ceredigion. Her work is greatly influenced by the Welsh landscape and her observations of natural forms. Sue uses patchwork, quilting and rag rug making techniques to recycle old clothes and household textiles into wall-hangings, rugs, hats, bags and other accessories. Sue is self taught and was a silk screen printer, TEFL teacher and traveller before settling in Wales over 30 years ago. Inspired by the beautiful, useful art of nomads Sue likes to make portable art in the form of decorative bags. Her designs are suggested primarily by the fabrics available to be recycled and their reflection of her vision of the natural world. I aim to create work that is expansive and spacious, capturing individual moments and merging realism with abstraction. Working mainly in acrylic and oils with additional elements such as paper, ink or what ever comes to hand I want to generate an energy and create beauty as an antidote to being bombarded by negativity. Nature is a starting point. Inspiration comes from ordinary things – snippets of conversations, strange light, shadows and shapes and colours. My studio is in Llanbrynmair and I am happy to take commissions, please contact me for a chat hilary@hrgraphics.co.uk or visit my website www.hilaryreedpaintings.com to see more of my work. In addition to her special Guest Artist display Hilary is one of our Featured Artists at Oriel Seren so her work can be seen all year round. Born in Carmarthen, South Wales in 1969 Jon had an unsettled childhood of children’s homes and foster care, and then lived on the road as a New Age Traveller before settling in Mid Wales to raise children Liam and Liana. A self-taught artist, Jon first developed his drawing skills doodling intricate illustrations on any scrap of paper to hand. Upon being given an A2 sized pad of paper as a gift, intricate mythological and spiritual drawings started to fill the pages. When asked if he was creating a book, Jon went back to the start and wrote about each picture in poetic form. Seven years later the book was completed and he put down the pens and picked up a chisel and began to carve wood and then slate sculptures. Visitors to his studio and gallery are welcome any time by appointment or on the Ceredigion Art Trail every summer. Jean Napier is a professional photographer specialising in the fields of landscape, social documentary and creative photography. Jean has lived in the magnificent Snowdonia National Park for over 25 years and it is the main inspiration for her work. The huge variety of landscapes with in the Park includes wild coasts, beautiful beaches, mountainous areas, marshes and green valleys. Another aspect that Jean captures in her work and which became the subject for her Masters in Fine Art at the University of Aberystwyth is the remnants left by man’s inhabitancy that date back thousands of years and the industrial past that has also left its marks on the land. Jean has been running residencies, teaching photography and a variety of art workshops for over 20 years to people of all ages and abilities. She has run a number of different digital photography workshops in North and Mid Wales. Jean has published four photography books on North Wales; three books follow some of the rivers from source to sea and one is about the slate industry. Her fourth book, entitled “Meirionydd – The Old Ways”, should be published by December this year. Each of the books on the rivers took more than three years to photograph; walking the rivers and exploring the land along the banks, interviewing farmers and researching the ancient history and industrial past. Erfyl Lloyd Davies has been involved in photography for over 25 years. His work includes Weddings, Portraits, PR, Press, Advertising and Video productions for websites. He is a Licentiate member of the SWPP (Society of Wedding and Portrait Photographers). Erfyl prints his photographs himself on archival quality paper. He also makes his own frames and has been offering a framing service for 5 years. During the years Erfyl has spent travelling around Wales photographing events he has had a wonderful opportunity to experience the landscape in different lights and all weather conditions. Erfyl lives in Dolgellau, a market town in Snowdonia, surrounded by mountains and the main base for climbing Cader Idris. Erfyl’s exhibition at Oriel Seren focuses on his landscape photography; beautiful, crisp images capturing the character and changing moods of the Welsh countryside.